It is actually quite interesting that we are getting an in-between story like this just when Zero Year is supposed to wrap up. If I remember correctly, the reason for the “delay” in the story for this issue, in that this was supposed to be a Zero Year story, is that Scott kept adding to the script and so obviously the artists all needed time to do their magic. Hence the guest artists and James joining up on this issue. I would have preferred the original story here of course, but I’m still fine with how things have ended up. And I gotta say, this was quite the story from start to finish, with Scott working his usual magic and his flair for interesting twists that really shock you. I mean, that’s one of the things that he is really good at and he certainly didn’t disappoint with this story. Its not his best issue by any means, but it is definitely in the top tier I’d say. The world that he shows in this issue, or rather, the Gotham that he shows in this issue is a strange beast. There are repeated references here that the city has pretty much gone to hell, people are under extreme sufferance, and Batman is very much a lone voice of reason, with a little help from some unexpected quarters. And there’s a new “kingpin” in town, the one person who controls all the city’s criminal gangs and their activities. In short, there is a ton of build-up here. A few weeks ago we were treated to a spoiler image from Scott, which was posted on Twitter. It showed a new character and it had fans guessing who exactly it was, whether someone we had already met, or someone completely new. Well, I’ll say that this is a character that we’ve already met, and that we see yet another “new” character, someone who showed up in the Thanksgiving promo-image from November. The former is really cool, and really badass, whereas the latter is in a proto-role here, before said character became someone… big. And on that note, I’m really excited for this character since I love the character from previous appearances and because of what it portends. There is some subtle (that is, unremarked) confusion concerning this character’s place in the grand scheme of things as far as continuity of the New 52 Bat-verse is concerned, but you know what, I’ll take it. On the art front, we have Dustin Nguyen on pencils, with Derek Fridolfs on inks, John Kalisz on colours and Sal Cipriano on letters. Overall, I really dig the different art. It is such a departure from what we’ve seen in the entirety of the series in its relaunch, and several moments are really nicely captured. Such as the splash page with all the credits. Amazing colour work there. I didn’t quite like Nguyen’s take on the first returning character that I mentioned above, because that’s not quite how I’ve seen said character in previous appearances. It is somewhat of a departure from the norm. Other than that though, all I can really say is that sometimes Batman appears to be a bit too angular, with a really sharp, blocky jawline, which was really odd. No other complaints though. Everyone’s done some great work here in general. And that’s that. Its not the issue I was expecting, and it is a bit different yes, but I liked it certainly. More Batman: #1-10, #11-12, Annual #1, #13-15, #16-18, #19-21, Annual #2, #22-23, #23.1, #23.3, #23.4, #24, #25, #26, #27. 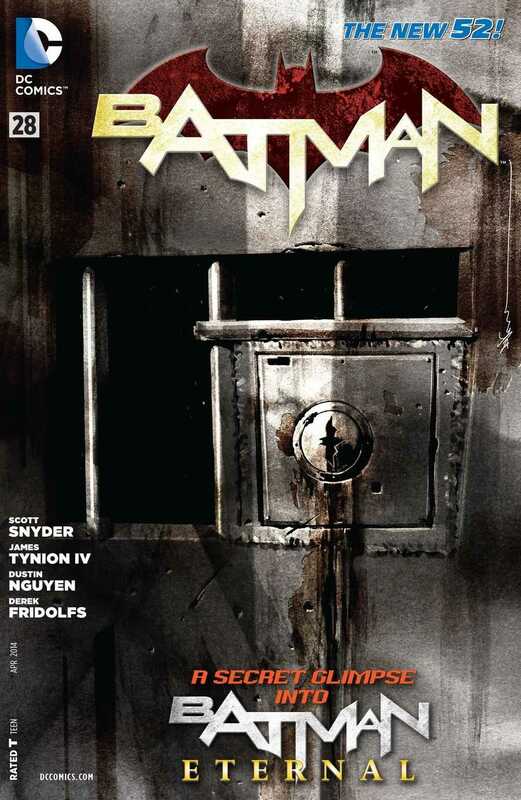 Posted on February 12, 2014, in Comics Reviews, Review Central and tagged Batman, Batman: Eternal, Bruce Wayne, Catwoman, Comics, Comics Review, Crime, DC Comics, Derek Fridolfs, Dustin Nguyen, Gotham, Harper Row, James Tynion IV, John Kalisz, New 52, Police, Review, Review Central, Sal Cipriano, Scott Snyder, Selina Kyle, Spoiler, Superheroes. Bookmark the permalink. 4 Comments.